Kathryn Boyle illustration: More BIG heads!! 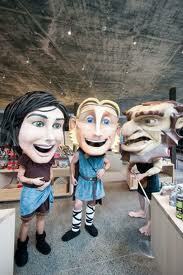 Una, Finn McCool and Benandonner. The Scottish giant begging for his life. Photo taken by National Trust. 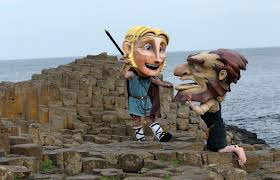 Finn McCool and the Scot's feud and stone throwing formed the Giant's Causeway! I had great fun making Finn and Una! Referring to stills from a promotional video the faces finally took shape. The character heads have to be durable as well comfortable for the performer to wear so lots of things need to be taken into consideration in the design and making process. The costumes really finish the character and it was great to see them at the causeway in the proper setting for the story.